WHCA Journalism Awards honor reporting on President Trump, his cabinet, and poor housing for military families. 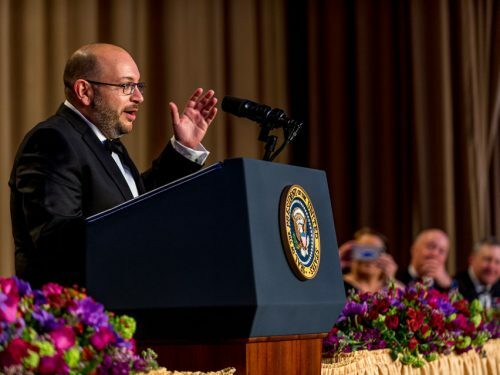 The White House Correspondents’ Association is pleased to announce that journalists from The Atlantic, Fox News, Reuters and the Washington Post are the winners of our 2019 journalism awards. The awards will be presented at the White House Correspondents’ Association Dinner on Saturday, April 27 at the Washington Hilton. “Congratulations to these excellent journalists! 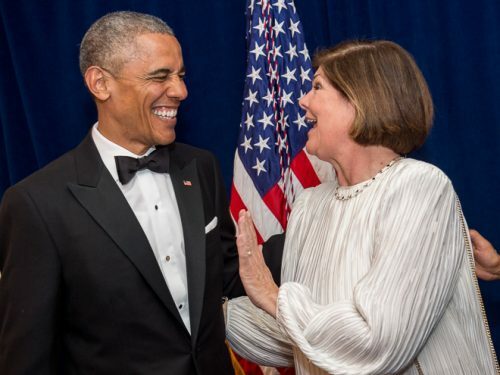 The WHCA looks forward to honoring them at our annual dinner, a celebration of the First Amendment and the importance of a free and independent news media to a healthy republic,” said Olivier Knox, WHCA president and chief Washington correspondent for SiriusXM. This award recognizes repeated excellence in White House coverage. The Aldo Beckman Award goes to McKay Coppins of The Atlantic. Reading McKay Coppins’ stories is sheer joy – amazing storytelling. Coppins’ stories about Mike Pence, Sean Spicer, Stephen Miller and other political players were impossible to put down. His stories sewed together a lot details to create complex portraits that increase our understanding of the current administration. His voice is refreshing. An Honorable Mention goes to Ashley Parker of The Washington Post. From the judges: Her vibrant, colorful and eminently readable stories inform and enlighten us about the inner workings and thinking of the Trump administration. It is solid, in-the-moment reporting. 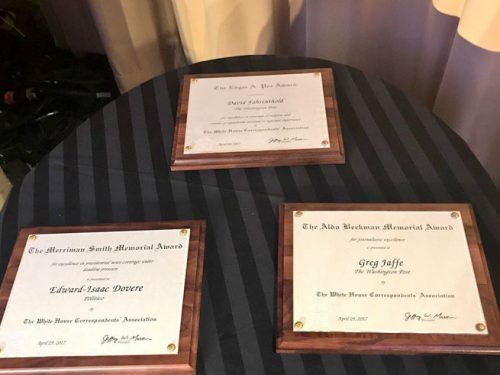 The Merriman Smith Memorial Award for excellence in presidential news coverage under deadline pressure is offered in two categories: PRINT including newspaper, wire service and magazine and BROADCAST including Radio and television. The Merriman Smith Award for broadcast goes to Ed Henry of Fox News for his interview with Environmental Protection Agency Administrator Scott Pruitt. EPA Administrator Scott Pruitt was already in trouble over ethical matters when he sat down for an interview with Fox News Chief National Correspondent Ed Henry. If he thought he was going to get softball questions, he soon learned otherwise. Henry, in the words of the Washington Post, lobbed question after question at Pruitt to ask him about big pay increases for cronies and a sweetheart deal for renting an apartment from a lobbyist. Pruitt struggled to answer and soon found himself out of a job. Henry was prepared, knew his facts and marshalled them for a penetrating interview, which made news, all under deadline pressure. An Honorable mention for the Merriman Smith Award in broadcast goes to CNN, Confirmation vote on Brett Kavanaugh. From the judges: CNN’s coverage on the day of the hearings on Supreme Court nominee Brett Kavanaugh was aggressive, relied on deep sourcing and felt like one was watching a symphony. The news-making moments in which Sen. Jeff Flake, R-AZ, was confronted by two women was just a piece of the extensive coverage that followed every angle, all day. See the coverage here. The Edgar A. Poe Award honors excellence in news coverage of subjects and events of significant national or regional importance, written with fairness and objectivity. The Edgar A. Poe Award goes to “Ambushed at Home” by Joshua Schneyer, Michael Pell, Andrea Januta and Deborah Nelson of Reuters. Reuters’ “Ambushed at Home” series exposes an area where the government has failed military families – hitting them literally where they live. The privatization of military housing was supposed to bring substandard Pentagon-owned homes up to snuff, but 20 years in Reuters found families “living in slum-like squalor,” with high levels of lead, vermin, mold, leaking ceilings and foul water. And it found that families on base have virtually none of the protections against landlords that renters in the civilian world do. Using meticulous records and data research, deep reporting – often against official pushback and sources’ reluctance to come forward – and straightforward writing, the Reuters team showed families put in danger, a military that often looked the other way and private investors who profited from it all. The judges felt the reporting “uncovered a situation that is remarkably damning” and – most important – has already resulted in action from Congress, the Pentagon and individual base commanders. “Ambushed at Home” fully meets the Edgar A. Poe Award criteria of “news coverage of subjects and events of significant national or regional importance to the American people,” and is a deserving winner of the award. In an exceptionally strong field of candidates, the Weather Channel and Telemundo documentary “Hidden Cost” stood out for its emotional punch and clear-eyed depiction of the problem of child and migrant farm labor. Almost 60 years after Edward R. Murrow’s “Harvest of Shame” brought the issue of migrant labor to light, “Hidden Cost” shows that the problem is still very much with us. Producer Solly Granatstein and correspondent John Carlos Frey spent months finding and then following one migrant family, using their travels and travails to show that the dangerous and backbreaking work, the sub-minimum-wage pay and the challenges that make it all but impossible to get an education or escape the fields have not gone away. It is a problem that every American has a hand in and the Weather Channel and Telemundo’s coverage of it is deserving of recognition. The Aldo Beckman Award for presidential news coverage recognizes a correspondent who personifies the journalistic excellence as well as the personal qualities exemplified by Aldo Beckman, the award-winning correspondent of the Chicago Tribune and former WHCA president. Competition is open to all journalists who cover the White House on a regular basis, or whose reporting is primarily devoted to coverage of the White House or the presidency. There is a prize of $1,000. The Merriman Smith Award honors presidential news coverage under deadline pressure. The award is in memory of the late Merriman Smith of United Press International, a White House correspondent for more than 30 years. The award was conceived to perpetuate Mr. Smith’s memory and to promote the excellence he brought to his profession. It is given in two categories: broadcast and print. Each includes a prize of $2,500.